Special Summer Rates! Luxurious Condo, Beachfront Balcony. Newly renovated! C'est La Vie/ 2BR/ 2BA Upscale Condominium located in the Regency condominium in Navarre Beach. Enjoy incredible gulf views and breathtaking sunsets from your own private balcony. This two-bedroom, two-bath, gulf-front condominium is beautifully decorated and is the largest (1520 square feet) you will find on Navarre Beach. We just bought a brand new flat screen HDTV for the unit! We also recently upgraded our condo with brand new beds in the guest bedroom. Located on the second floor, you are only steps away from the beach, the pool and the new fitness center. Relax on the unusually large balcony that spans the entire width of the condominium. The balcony can be accessed from both the master bedroom and the living area. The Regency has over 400 feet of private beach and is proud be the least congested condominium in the area. Emerald-green waters and snow-white sand await your pleasure. 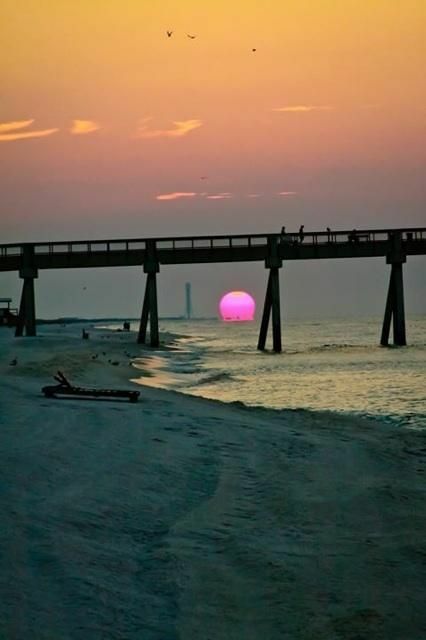 Navarre Beach is known for its relaxed atmosphere and is less crowded than the neighboring beaches. A large pier is in walking distance and offers fishing, music, and entertainment. Destin and Pensacola are 30 minutes away. Navarre Beach Regency has the largest balconies on Navarre Beach-absolutely breathtaking view of the Gulf! Our condominium has nine-foot ceilings, a large fully-equipped kitchen, and a spacious living area with a 52-inch large screen TV (VCR/DVD/and stereo/CD player). The master suite has a king-sized bed, TV/VCR//DVD, and private bath with whirlpool tub. The second bedroom has two queen-sized beds, TV/VCR/DVD, and adjoining bath with whirlpool tub. The living area is furnished with a queen-size sofa sleeper. This condominium will comfortably sleep eight. On the ground floor of the Regency you will find charcoal grills, and storage for your bikes, water toys, beach chairs, etc. Have been vacationing at Navarre since we were children. Relaxing, get away from it all. Beautiful sunsets. Beach front property. 1 king, 2 doubles, 1 sleep sofa. Whirlpool tub, large private balcony with ocean views. The pictures don't do this place justice. The location and the atmosphere of the the condo is spectacular. The huge deck with the pier view watching sunsets is breathtaking. The kitchen was fully stocked, the washer and dryer in the unit was a helpful bonus. The sand is white, the ocean is blue, we found lots of shells to bring home, the kids surfed the waves and we all hunted for crabs in the evening. The very short walk to the pier for the view and to watch the fisherman is well worth it. We saw lots of dolphins swimming by in the mornings. We used Walmart grocery app to order our groceries and we drove thru and picked them up, highly recommended! We had a wonderful stress free week stay here and it could not have been better. We are so glad to hear that you had a great vacation, and we hope to hear from you again on your next trip to Navarre! Activities (on site or nearby): hiking, rock climbing, biking, golf, tennis, fitness center, miniature golf, fishing, zoo, boat launch for Santa Rosa sound, water parks, naval aviation state park, shopping, restaurants cinemas, museums, sightseeing, state park and picnic areas, volleyball tournaments, fishing pier, swimming, snorkeling/diving, boating, sailing, waterskiing, surfing, para sailing, jet skiing, shelling, outlet malls. $700-$1600/week Check-in: 3:00 p.m. Check out: 10:00 am 10.5% tax , $75.00 housekeeping charge and a refundable damage deposit of $250.00 is due on top of the rate. Key-less entry! No timely check-in procedure. Everything is handled prior to your arrival! Saturday to Saturday rentals. We accept checks, MasterCard, Visa.